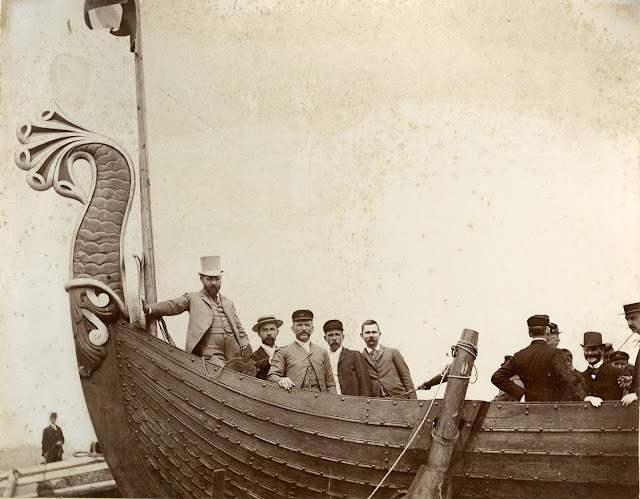 The Digital Research Library of Illinois History Journal™: The Viking Ship at the 1893 Chicago World's Columbian Exposition. 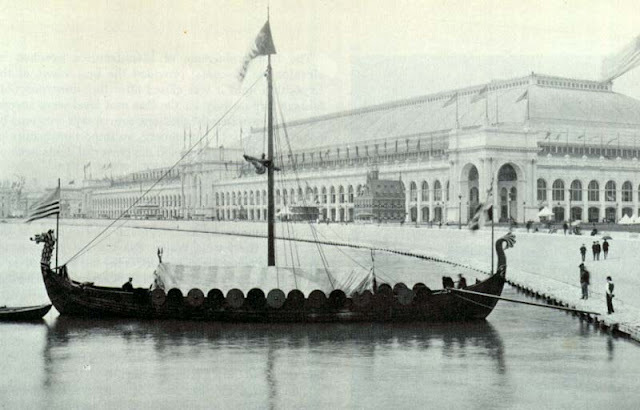 The Viking Ship at the 1893 Chicago World's Columbian Exposition. 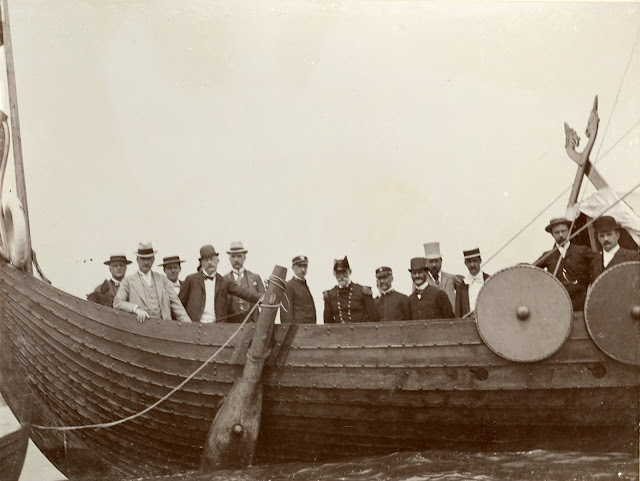 The Viking ship, which divides the naval honors with the Spanish caravels, is constructed on the model of that discovered in the “Kingsmound” at Gokstad, near Sandefjord, Norway, by a sailor in 1880, and built at Christen Christensen's Framnes Shipyard in Sandefjord, Norway in 1892-93 by popular subscription for the 1893 World's Columbian Exposition to be held in Chicago. Captain Andersen and the Viking Ship Crew of 11 Sailed from Norway, Across the Atlantic Ocean in 27 Days Without any Assistance to Chicago's World's Fair in 1893. 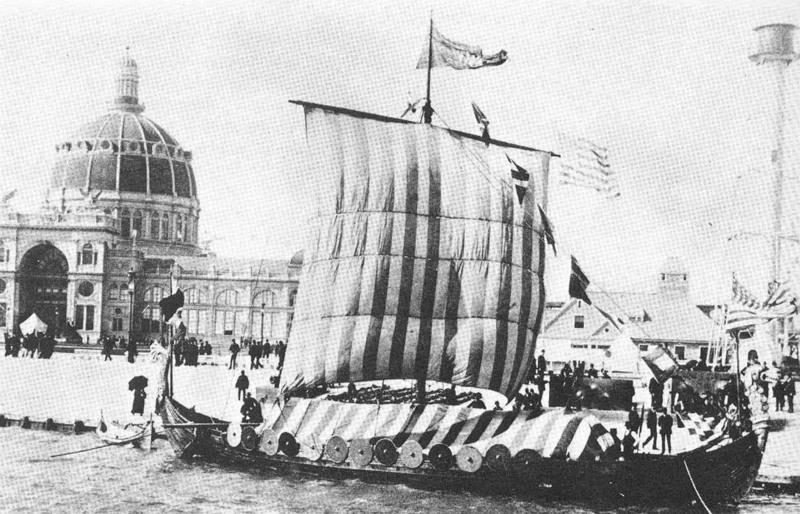 She is of oak, clinker built, its planks are fastened together with thousands of iron rivets, caulked with cow's hair spun into a sort of cord, seventy five feet over all in length, sixty feet on the keel, a beam of fifteen and a half feet, and a draught (British spelling of draft) of three and a half. At the prow rises high in the air a great carved dragon's head, and the tail of the beast appears at the stern, both richly gilded and the splendor of the vessel is further increased by the row of shields along each bulwark, in yellow and black, and, when in commission, by the red and white striped roofing. At the stern is a massive “high seat” for the chief or “Jarl,” covered with carved Runic inscriptions; there are no decks excepting two small ones, fore and aft, and the rigging consists of one mast that can be taken down, and one yard carrying a great square sail. The oars are sixteen on each side, each seventeen feet long, and the ship is steered by an oar on the starboard side, near the stern, after the old sea-king fashion. 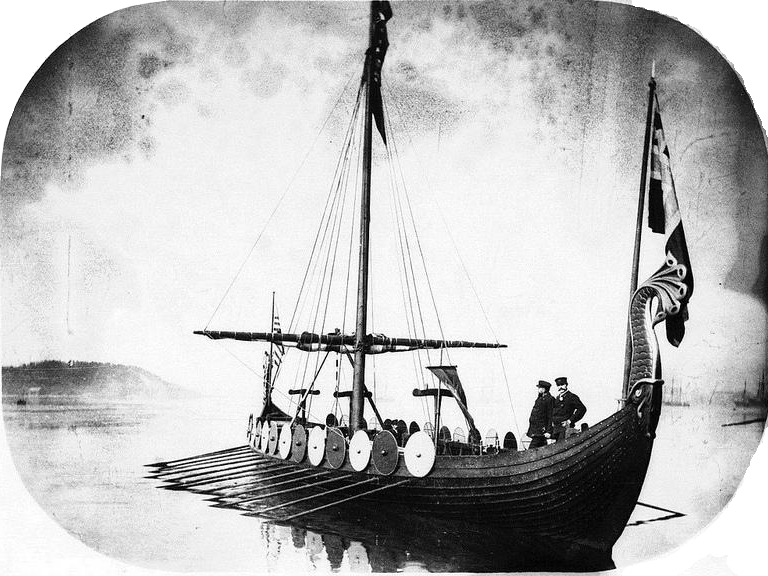 At sea, the Viking averaged 10 knots and the hull was observed to flex with the waves. In 1893 the Viking sailed from Norway to Chicago, via the Erie Canal and the Great Lakes, and became one of the greatest attractions at the World's Columbian Exposition. At the close of the Fair the Viking traveled to New Orleans. The next year she was returned to Chicago and presented to the Field Columbian Museum. Soon the Viking was in dry dock along side the Museum. The Federation of Norwegian Women's Societies saw her plight and began a restoration effort. 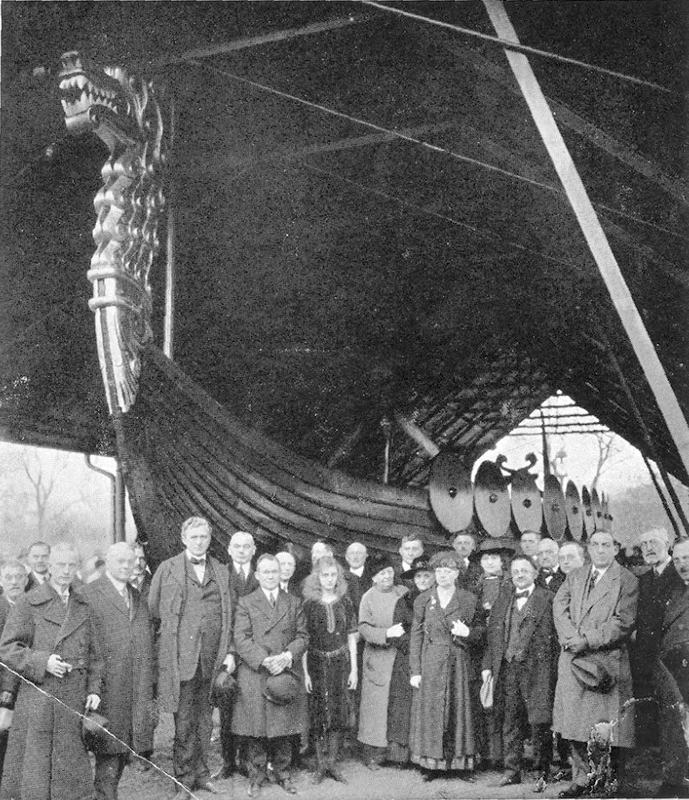 After her repair and restoration the Viking was relocated to Lincoln Park in 1920, placed under a fenced-in, wooden shelter and transferred to the care of the Commissioners of Lincoln Park which later consolidated into the Chicago Park District. 1920 Viking Ship Dedication at Lincoln Park Zoo. 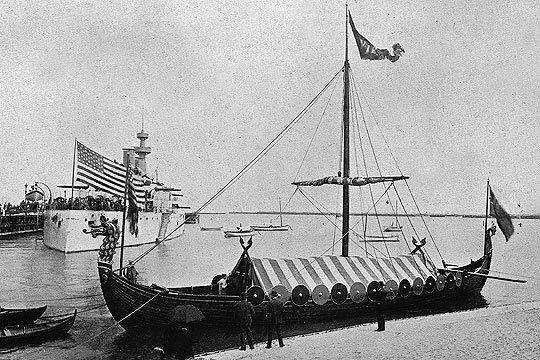 Viking at the Lincoln Park Zoo, Chicago, Illinois, in the early years. Viking at the Lincoln Park Zoo, Chicago, Illinois, with a barbed-wire fence to keep out vandals in the later years. 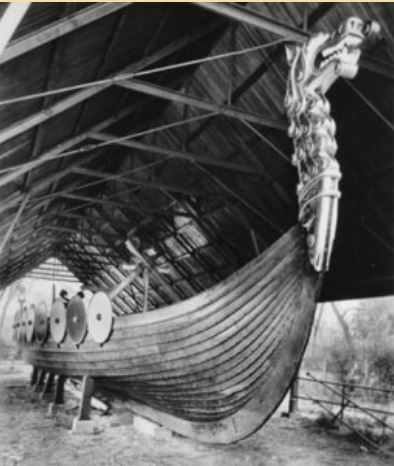 Although legal trustee of the Viking ship, the Chicago Park District set aside no funds for maintenance of the boat or its shelter. 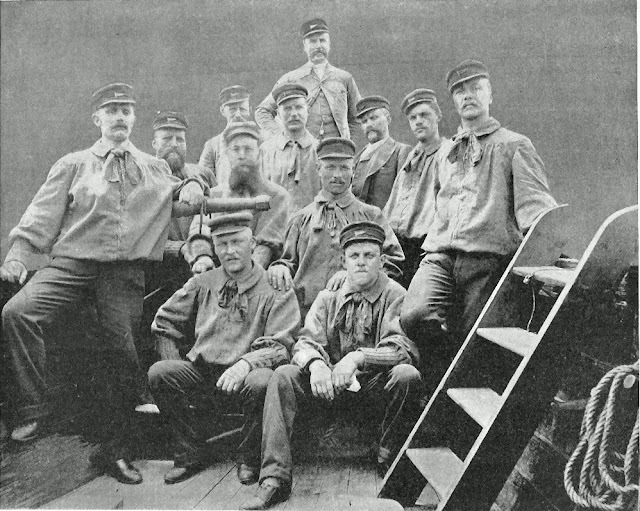 For many decades the Norwegian-American community provided maintenance to the ship. But as the years passed, the Viking began to suffer. 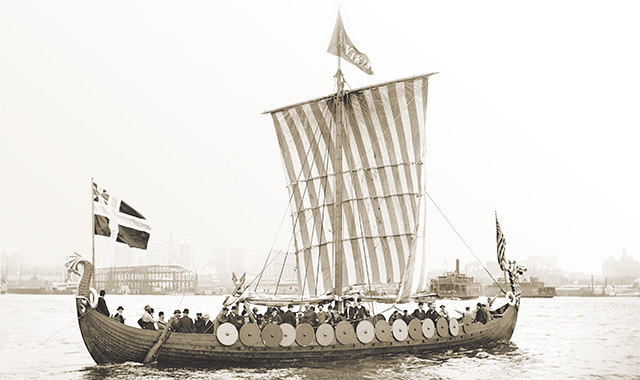 In 1978 the Scandinavian-American community rallied by forming The Viking Ship Restoration Committee, whose goal was to restore the Viking and find suitable permanent housing. The Committee consisted of individuals from various Scandinavian organizations. They raised funds through donations and began efforts to place the Viking ship inside the Museum of Science and Industry. Once close to success, their attempt failed. 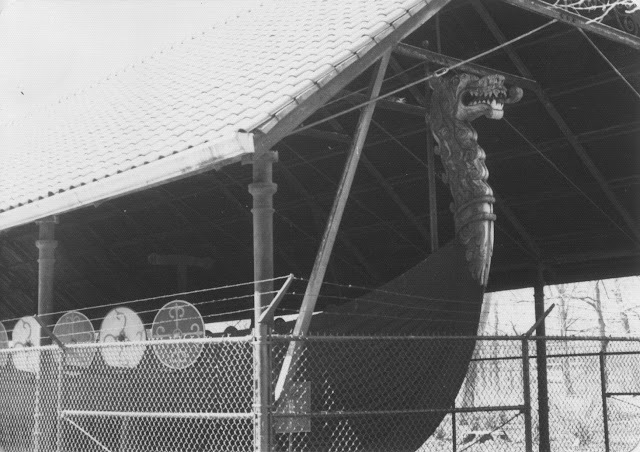 In 1993 the Chicago Park District made it known that the Viking would have to be moved from its location to make room for expansion of the Lincoln Park Zoo. 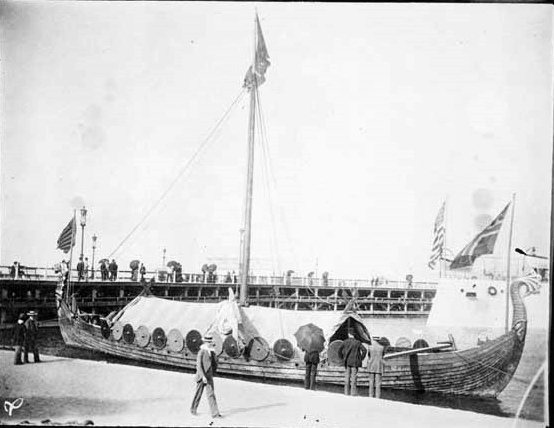 The General Superintendent of the Chicago Park District wrote to the Viking Ship Restoration Committee, requesting that the ship be cleaned, tarped and moved from Lincoln Park to proper storage. When the Viking Ship Restoration Committee did not respond to their letter, the General Superintendent sold the ship to the American Scandinavian Council in 1994. The American Scandinavian Council assumed the obligation to display, repair and care for the ship within Chicago. The Council transported the Viking some 40+ miles to a materials yard in West Chicago and secured it under a canopy. 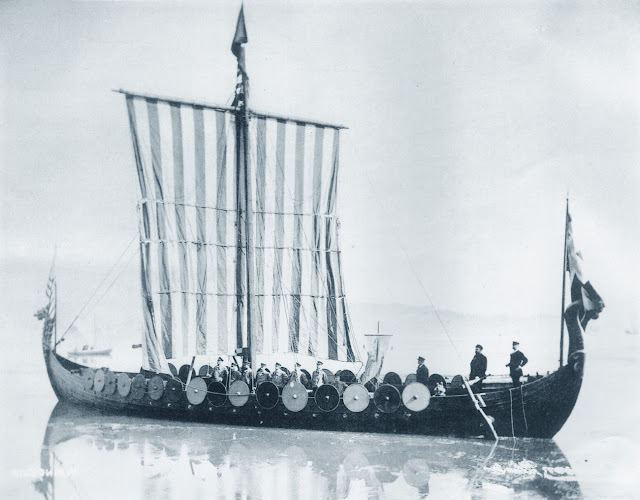 Two years later the Viking was moved to Good Templar Park in Geneva, Illinois. The American Scandinavian Council invested a portion of its money in blueprints and architectural plans for several possible locations. 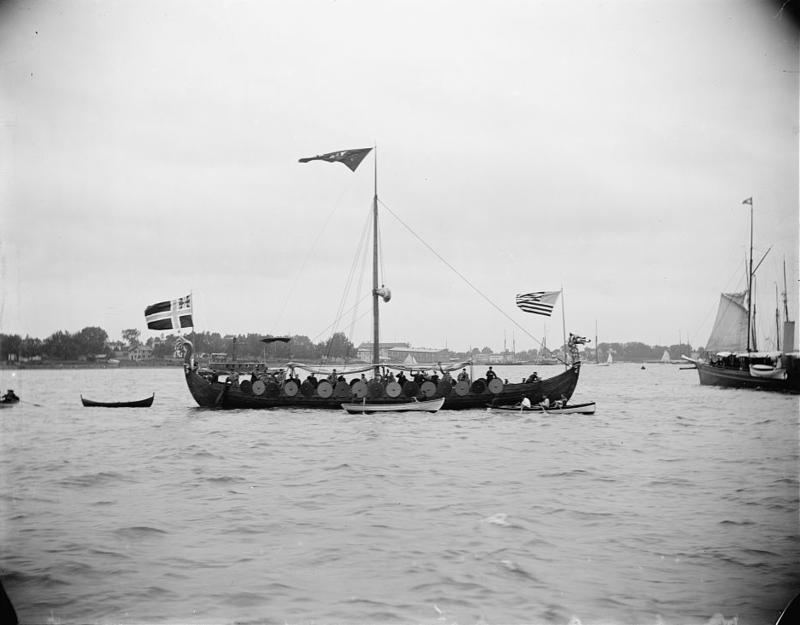 The Council came close to placing the Viking in its own museum, at one time on Chicago 's museum campus, and at another time near Navy Pier, but the attempts failed. In 2001 the Scandinavian-American Council ceased to exist before accomplishing its obligations. The Viking ship remains in Good Templar Park in Geneva, Illinois. The fabric canopy has been replaced several time. The dragon "head" and "tail" of the Viking ship are in storage at the Museum of Science and Industry. A ship this beautiful, which we also believe is the largest remaining artifact of the World's Columbian Exposition in Illinois, deserves to be preserved. The Viking should be valued for the fine ship she is and placed into a museum. On February 28, 2007 the Viking was declared one of ten most endangered historic sites in Illinois by "Landmarks Illinois", a statewide historic preservation advocacy group. On November 10, 2007 the Viking received a $52,000 Partners in Preservation grant from American Express and the National Trust for Historic Preservation. 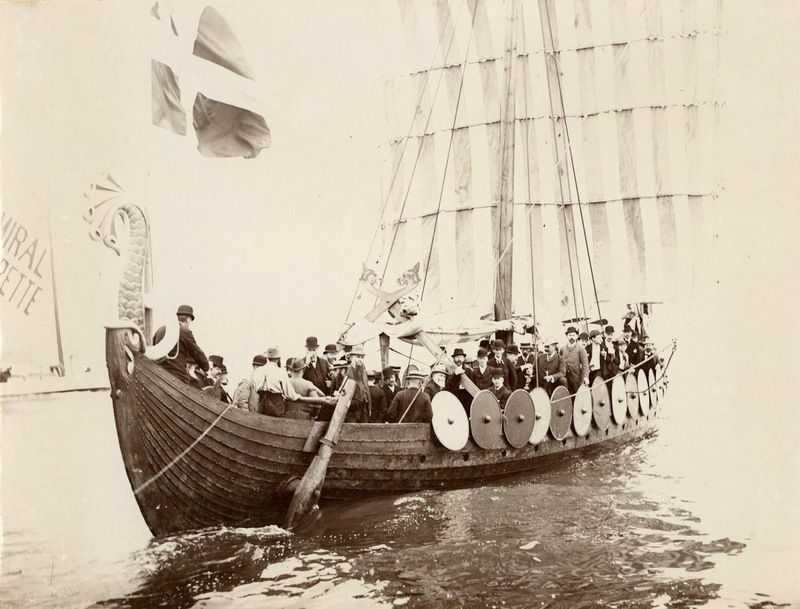 The Trusteeship of the Viking Ship was officially transferred from the Chicago Park District to Friends of the Viking Ship in a courtroom signing of an agreed order on September 12, 2012. The Most Beautiful Ship Ever Built. 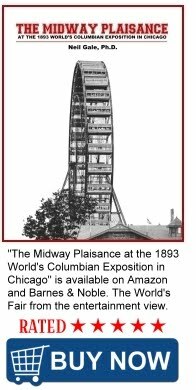 to Chicago's World Columbian Exposition.